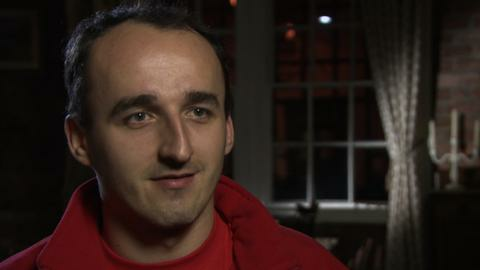 Robert Kubica says a return to Formula 1 remains a "dream" but is "nearly impossible" based on the current state of his injuries sustained in an horrific rallying accident in 2011. The Pole has returned to rallying, winning the second division of the World Rally Championship last month. The 28-year-old told BBC Sport: "I would be able to drive an F1 car on one or two circuits for testing. "But it doesn't make sense to test for a day if I cannot race." Kubica, who won the 2008 Canadian Grand Prix for BMW Sauber, was considered to be one of the best drivers in the sport at the time of his crash. But following the accident, in which he partially severed his right hand, Kubica has restricted movement of his arm and fingers. That makes driving in the narrow cockpit of a single-seater car difficult. But Kubica said: "He can express his opinion. It's clear to see I have limitations. I think there is only one person who can judge what I can do behind the steering wheel - and that's myself." Asked if he still had hopes of returning to F1, he replied: "It's a dream, a target, but for now, it's very difficult, I would say nearly impossible. "I will never take the opportunity if I don't feel 100% ready. If one day things improve, for sure we will see. For now, I am concentrating on rallying." Kubica is making the step up to the top tier of rallying in a one-off appearance for Citroen in the Wales Rally GB, which starts this week. "I focus on my recovery - and rallying is helping me a lot in this," he said. "I can see a lot of improvement behind the wheel in a rally car. "Driving on gravel is very demanding. There are lots of movements on the steering wheel which put a lot of stress on my arm and my hand. "But I know this does not help my biggest limitation, which is driving a single-seater. "I do not have the power to take control of it, but I will try my best." The Pole, who said earlier this year that he misses F1, has taken heart from the positive feedback and reactions he has received following use of the Mercedes F1 simulator. "It helped me a bit," he added. "Every time I go there, I see progress on my rehabilitation. It's positive to see, but what the future will bring, I don't know." Kubica, who has also tested a DTM German Touring car Mercedes, is unsure of his plans for next season, adding that he has a couple of options on the table. "If I stay in rallying next year, I would like to do a whole season," he said. "But to do all the rallies in one year is quite a big challenge. "One option is to come back to circuit racing. For sure, it won't be single-seaters, but I haven't got it clear in my mind what I will do."